Astronomers see Titan - Solar System Planets And Moons Section. Astronomers see New Storms on Titan. storms around Titan's south pole. Astronomers had seen storms around Titan's south pole before, but now they've been discovered at the moon's mid-latitudes as well. The discovery was made using the Gemini North and Keck 2 observatories, which have adaptive optics systems capable of resolving Saturn's largest Moon with great detail. These storms could be created by surface activities, like cryovolcanoes which could spew an icy mix of chemicals into the atmosphere. It could also be caused by seasonal temperature changes, like the weather here on Earth. Using adaptive optics on the Gemini North and Keck 2 Telescopes on Mauna Kea, Hawai'i, a U.S. team has discovered a new phenomenon in the atmosphere of Saturn’s largest Moon Titan. Unlike previous observations showing storms at the south pole, these new images reveal atmospheric disturbances at Titan’s temperate mid latitudes-about halfway between the equator and the poles. Explaining the unexpected activity has proven difficult, and the team speculates that the storms could be driven by anything from short-term surface events to shifts in global wind patterns. "We were fortunate to catch these new mid-latitude clouds when they first appeared in early 2004," said team leader Henry Roe (California Institute of Technology). "We are not yet certain how their formation is triggered. Continued observations over the next few years will show us whether these clouds are the result of a seasonal change in weather patterns or a surface-related phenomenon." The causes of these storms might include activities that disturb the atmosphere from the surface. It’s possible that geysers of methane "slush" are brewing from below, or a warm spot on Titan’s surface is heating the atmosphere. Cryovolcanism-volcanic activity that spews an icy mix of chemicals-has also been suggested as one mechanism that would cause disturbances. It’s also possible that the storms are driven by seasonal shifts in the global winds that circulate in the upper atmosphere. Hints about what is happening on this frigid world could be obtained as the Huygens probe from the Cassini mission drops through Titan’s atmosphere in mid-January, 2005. The Gemini-Keck II observations were the result of good timing and telescope availability. According to Gemini scientist Chad Trujillo, Titan’s weather patterns can be stable for many months, with only occasional bursts of unusual activity like these recently discovered atmospheric features. The chances of catching such occurrences depend largely on the availability of flexible scheduling like that used at Gemini. "This flexible scheduling is absolutely critical to Titan meteorology studies," he said. "Imagine how hard it would be to understand the Earth's diverse meteorological phenomena if you only saw a weather report a few nights every year." Like Earth, Titan is surrounded by a thick atmosphere of mostly nitrogen. Conditions on Earth allow water to exist in liquid, solid, or vapor states, depending on localized temperatures and pressures. The phase changes of water between these states are an important factor in the formation of weather in our atmosphere. Titan's atmosphere is so cold that any water is frozen solid, but conditions are such that methane can move between liquid, solid, and gaseous states. This leads to a methane meteorological cycle on Titan in analogy to the water-based weather cycle on Earth. As it does on Earth, seasonal solar heating can drive atmospheric activity on Titan, and this could be the mechanism behind the previously observed south polar clouds. 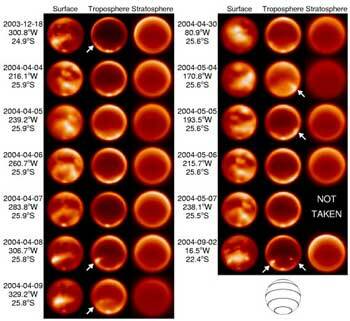 However, the new temperate-latitude cloud formations cannot be explained by the same solar heating process If a seasonal circulation shift is causing the newly discovered features, the team theorizes that they will drift northward over the next few years as Titan’s year progresses through the southern summer and into autumn. If it is being caused by geological changes, such as methane geysers or a geologic "warm" spot on the surface, the feature should stay at the observed 40-degree latitude as the surface activity spurs changes in atmospheric convection and methane cloud formation. Continued storm formations will be easily distinguishable in future ground-based observations using Gemini, Keck and other adaptive-optics enabled telescopes. "Using adaptive optics from the Earth allows us to see things that just a few years ago would have been invisible," said Keck Scientist Antonin Bouchez. "These observations show that ground-based Telescopes are a perfect complement to space missions like Cassini." This research is scheduled for publication in the January 1, 2005 issue of the Astrophysical Journal.